THE REVIEW: Of the nominees for Best Picture this year, one of the films I knew and heard the least about was Hell or High Water. 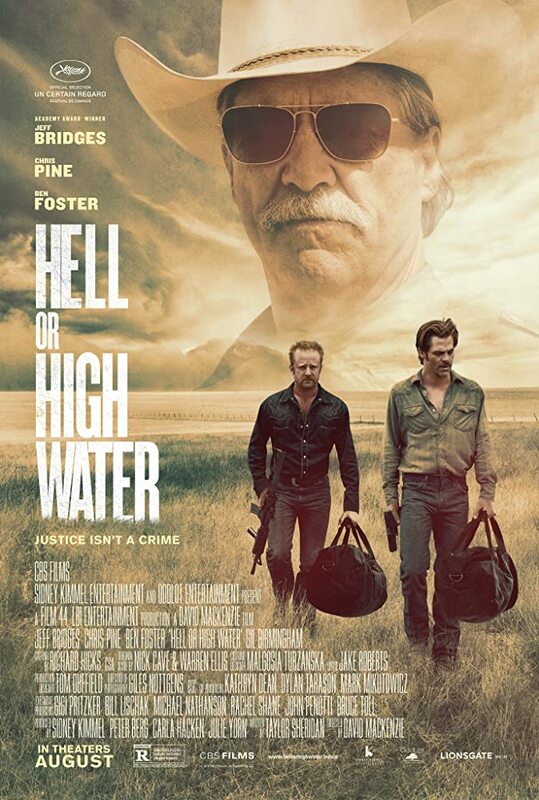 Despite the general lack of buzz or even awareness of the film, I was surprised just how much I liked the film and instead of burying the lede I’m going to come right out and say Hell or High Water is near the top of my list for personal favorite films this past year. There’s a very subdued feeling about the film. Even though the story is about a series of bank heists and there are a good deal of action scenes and car chases, overall it’s just very quiet. Not much seems to happen and things do seem a bit Groundhog Day-esque, repeating over and over again. The brief moments of adrenaline are balanced with Ranger Marcus Hamilton (Jeff Bridges) going on stake outs and the two bank-robber brothers Toby and Tanner Howard (Chris Pine and Ben Foster) discussing their late mother’s estate. You must be thinking, “All of this sounds boring, even if you like personal finances and watching tumbleweeds roll by,” (spoiler: there actually aren’t any tumbleweeds). True, but my only response is the film isn’t like that at all. Director David Mackenzie doesn’t miss a beat and finds a way to make the uninteresting interesting. It’s not actually about the finances, it’s about the Howard brothers’ relationship with each other, and how it is so often strained leading to conflict. A stake out isn’t just watching nothing for hours on end, it’s Ranger Hamilton getting a steak — side note: that waitress has the best bit part I’ve seen in a while — and shooting the breeze with his partner Ranger Parker (Gil Birmingham). So in a way it’s got the best of both worlds for an average filmgoer: it’s got action in the form of bank heists (my favorite kind of heist, well, except for a casino) and it’s got terrific characters and character development. Around the board, some knockout performances which help deliver an engrossing film. And Hell or High Water does turn into a package deal. The opening scene is the first bank heist which wets your feet and got me acclimated to what to expect (again, seeing as I had not clue about anything coming in to the film). But even after being primed for a bank heist in the western genre, I was surprised again to see the characters play such a big role in the film. While heists could easily be one of the easiest draws into a film for me, the characters are what sold me and has me singing the high praises of this film.